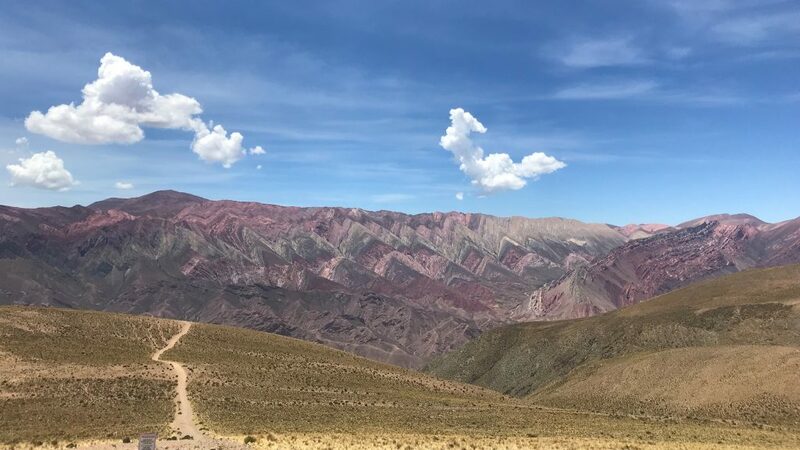 Salta & Jujuy region in the northwest of Argentina, bordered by Bolivia and Chile, is a wee bit off the tourist track. 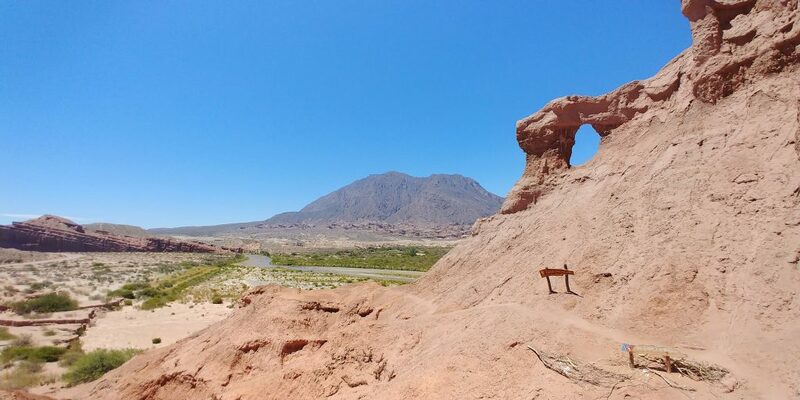 The dry dusty landscapes in the region has more in common with Bolivia and Northern Chile rather than the rest of Argentina, but it is gorgeous in its own way. The sparsely populated region has some exceptional locations like Valle de Calchaquíes, Purmamarca, Salinas Grandes, Cuesta del Obispo etc. 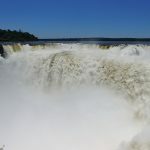 and is one of the underrated places in Argentina. 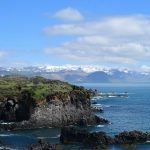 The best way to explore this region is by car, as it is more about the views along the road, rather than the destinations. The landscape is a stunning mix of craggy rocks, ravines, dusty hills and green valleys. 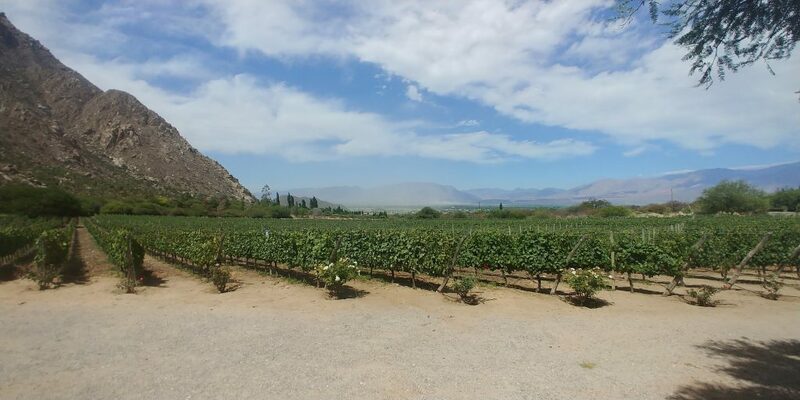 The dry landscape lends itself well to wine making and the Salta region is the second home of Argentinian wine making, after Mendoza. All in all, it is a fascinating landscape with a mix of remarkable & challenging roads to drive on. We spent 8 days driving around the region. We reached Salta at 12:30 after a 2-hour flight from Puerto Iguazu. There is an option of a shared shuttle bus to town – apart from the usual taxis – which we took. Our hotel in Salta, Hotel Almeria, turned out to be delightfully old fashioned, with the lobby feeling like someone’s casa rather than a commercial hotel. 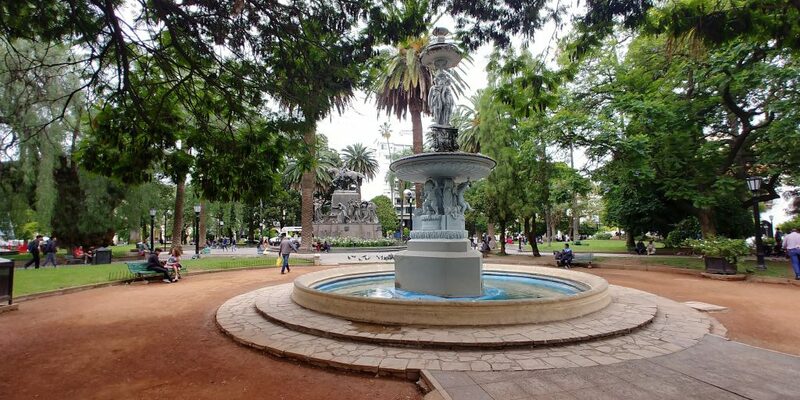 It is located very centrally, and is just a 8-10 minute walk from the town square – Plaza 9 de Julio. We grabbed a quick lunch at one of the cafes around Plaza 9 de Julio (nothing memorable) and spent the next few hours walking around the plaza. The Museo de Arqueologia de Alta Montana (the Museum of High-Altitude Archaeology) houses three frozen-in-time 500-year-old mummies of Inca children sacrificed and left in 22,000 ft Mount Llullaillaco in the region. At any point in time only one of the three mummies is displayed. When we visited, it was “El nino” (aka the boy), which is the most well-preserved of the three. The mummy is eerie because of how well-preserved it is. The plaza also houses the pink colored Catedral Basílica de Salta (Tip: The church is closed for visitors from 12:30 to 16:30 in the afternoon). After wandering around a bit more, we stumbled upon a perfect place for dinner. El Solar del Convento, with some Asian options, was heaven sent for us. The chicken curry with rice and chicken teriyaki with rice hit the perfect spot on our palate. Highly recommended if you are in Salta and are tiring of parrillas and Argentinian pizzas. Next morning, we checked out of our hotel and picked up our rental car at Hertz – a white colored Chevrolet Joy, with 36,000 odd km on the clock. The car was well maintained and we were soon on our way towards Cafayate. But there are dozens of other named and unnamed places that make you want to stop and take photos of the gorgeous vistas around. And with traffic really sparse in early December, stopping and taking photos was not a problem at all. The drive took us 3.5 hours, with multiple stops on the way for photos. (It can probably be done in 2.5 if you aren’t stopping, but then what’s the point). 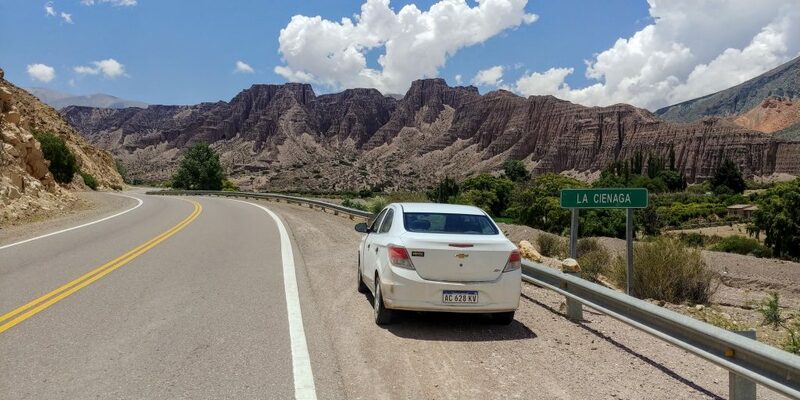 Tip: The must-see stops from Salta to Cafayate are easy to miss if you are driving fast, as the signs are not very prominent. It is helpful to add them as stops on your Maps app before leaving Salta (no cellular network afterwards). We had added these but still ended up missing one. In Cafayate, we had no trouble finding our hotel, Hotel Asturias, which was metres away from the main town plaza and had its own separate parking ground. Since we reached only at 15:30, we were famished, and quickly headed out for lunch on the plaza. It was a typical touristy resto-bar with Argentinian food. But the star of the menu was the Guiso de Lentejas – a lentil stew, which is a regional recipe. For us Indians, it is like the Punjabi kaali dal without any spices. It can be made with or without meat. The Cafayate place served it without meat. We had tried it once before in Buenos Aires, where they had added chorizo pieces to it. Either way, it feels like comfort food. We did not have anything else planned for the rest of the day. Quilmes people were a pre-Columbian tribe who founded the city of around 850 AD. They victoriously held off the Inca (who conquered most of South America), and then held out against the Spanish for about 130 years, before succumbing in 1667 AD. The Spanish made sure the Quilmes were never going to bother them again, by marching the whole population to Buenos Aires, over 1400 km away. Most of the Quilmes perished in the march and the city was abandoned. Tip : Even today, there is a suburb in Buenos Aires called Quilmes and the most popular beer in Argentina is also called Quilmes. 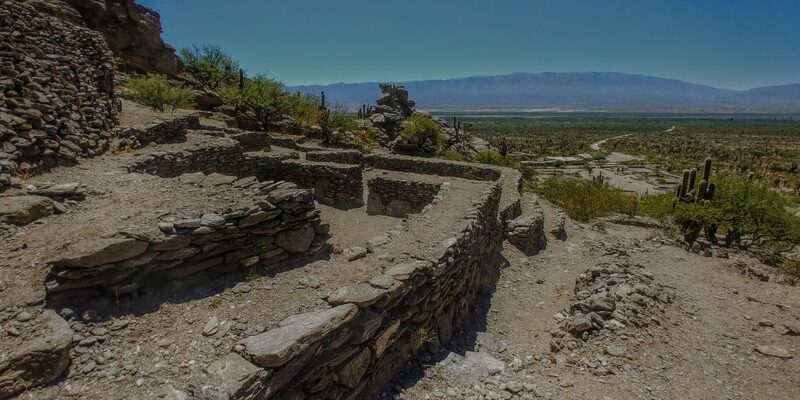 The original Quilmes city lies 54 km outside of Cafayate. It is built on a hillside, laid out in terraces, and giant wild cactus have taken over the ruins. What is now left are the walls of individual houses and buildings – their thatched huts having fallen off long time ago. 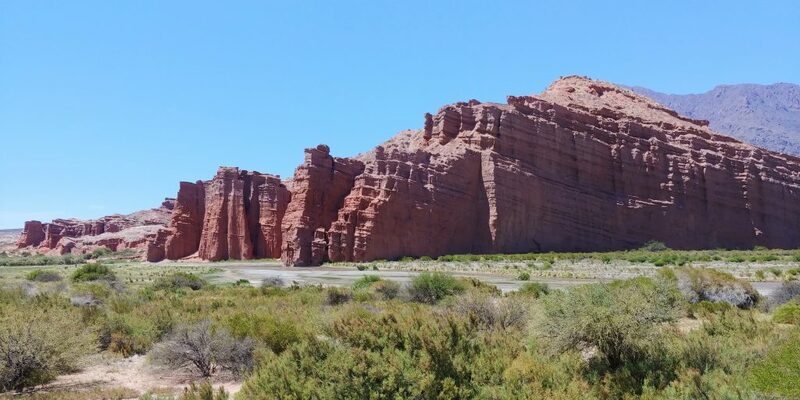 We reached Quilmes around 11:00, after having driven an hour from Cafayate. The last 3-4 km are on gravel road, but tightly packed and quite smooth. With the start of the summer in the southern hemisphere, the sun during our visit was really strong, and made the climb up to the top of the city of Quilmes quite difficult. The view from the top of the city is quite good, but the best view of the city is from the two guard towers on either side of the city. There is a small museum at the gate, which has a nice 10-minute video about the Quilmes tribe, as well as ceramic finds from the site. Entry to the museum is included in the entry fee of 100 pesos. We were there on the site for 2 hours, but that would be mostly due to our huffing and puffing while climbing the hill. One hour should be enough if you don’t want to venture too high. And in a nice bonus, we spotted a grey fox resting under the shade of a tree near our parked car. The road to Quilmes from Cafayate is lined with vineyards & bodegas (wine cellars) and we had planned to stop at one of them for lunch. The Salta region is not as famous as Mendoza for wines, but the cold & dry weather produces some unique tasting wines, mostly Torrentes (white), which is a speciality of the region. Malbec (red) is the other vine type grown. They even have wine flavoured ice cream in Cafayate – it was interesting to try it, but nothing to write home about. 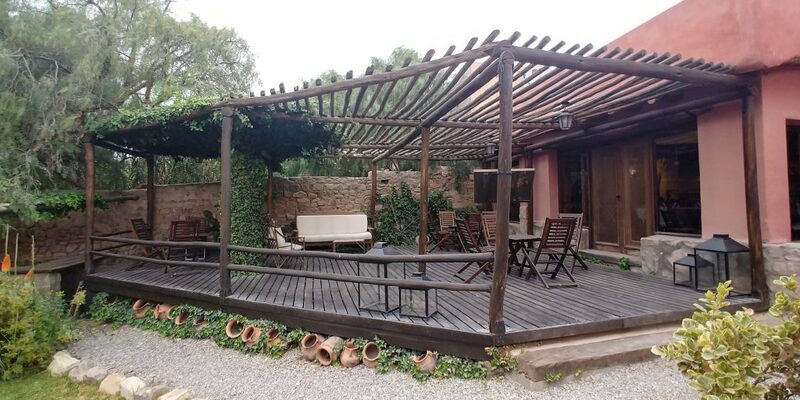 On the way back from Quilmes, we stopped at one of the vineyards, Finca Las Nubes, since it was highly rated on TripAdvisor. The approach road could be better marked, but once you are inside, the pretty location with tables laid out under trees next to the vineyard, will immediately make you delighted. We did a small round of wine tasting (free! ), before settling down with a bottle of Rose and some lunch. Once they kicked us out at their closing time (16:00), we headed back to our hotel. Tip: The Finca Las Nubes website says closing time is 5:30pm, but they closed at 4pm. I have a feeling they might have closed even earlier if there were no guests – we were the last ones there. So would advise reaching there by 2pm so that you get some time to enjoy the views and the wines. This was the toughest driving day on this roadtrip, with about 160 km on gravel roads! The drive can be split into halves. 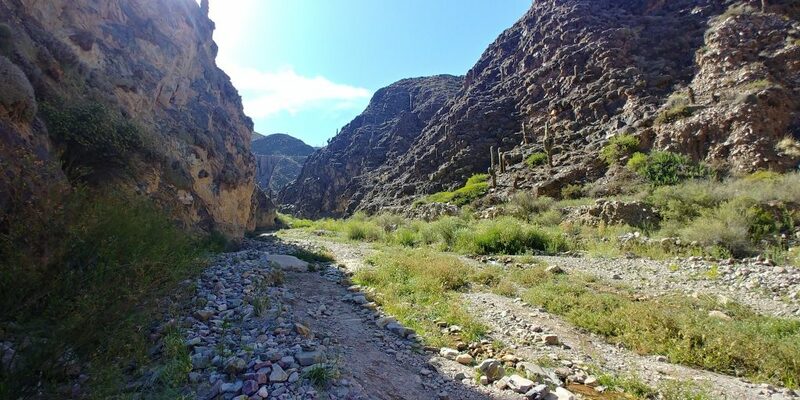 The first part from Cafayate to Angastaco has very beautiful views and took us through Quebrada de los Flechas (Ravine of Arrows). While this was on gravel roads, it was to a large extent flat and we covered this distance in 2 hours, with several stops along the way for photos. After crossing Angastaco, the landscape changed. The roads wound up and down hills and became a lot more challenging, taking us about 2.5 hours, with hardly any stops. We had left Cafayate at 10.30am and by the time we reached Cachi at 3pm, most of the eating places were closed. Thankfully, one place on the plaza, Oliver’s Bar, was still open and we grabbed some lunch. It may have been better to stop at one of the villages on the way (Angastaco or Milonos) for lunch. It was too hot to do anything else after lunch and we scurried back to our room. Cachi does not really have any hotels. We could only find hostels and some homestays. We had booked a homestay room via booking.com. It was a small outhouse, but thankfully clean enough and since we were staying there for just one night, it served its purpose. We walked around Cachi in the evening. It was more of a village than a town and offered the usual plaza (town centre) with a church at one corner and people chilling in the park at the plaza. There is nothing to do here and that was sort of the point of the place. Today was a relatively easier driving day with ~160km of driving from Cachi to Salta on paved roads with not too many switchbacks. We left Cachi around 9:30am. The main thing to see en route was Las Cordones national park, which consisted of huge cactuses growing on either side of a straight road. The point to stop on this straight road is called Recta del Tin Tin. Though the specific viewpoint itself is no different from other places on the road, so you can pretty much stop anywhere. 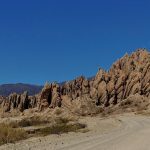 We did not pass through too much traffic on the way – even less than what we had seen on the way from Salta to Cafayate and Cafayate to Cachi. But as we got closer to Salta, we started seeing some tour buses in the opposite direction, mostly tourists doing a day tour from Salta to Cachi. As we drove more, views got greener and greener and the cactus filled landscape changed into trees and forests. At the highest point of the road lies Cuesta del Obispo, which has a church – just a single room with a cross actually. We would have probably missed stopping there since the church did not look interesting, but we saw a bus full of tourists get down at the spot. Curiosity got the better of us and it turned out to be a good decision, because the panoramic view from that point were really beautiful. The rest of the journey was uneventful and we reached Salta by lunch time, where we had booked a room in Hotel Almeria again. Today was the longest drive of our Salta-Jujuy stint. 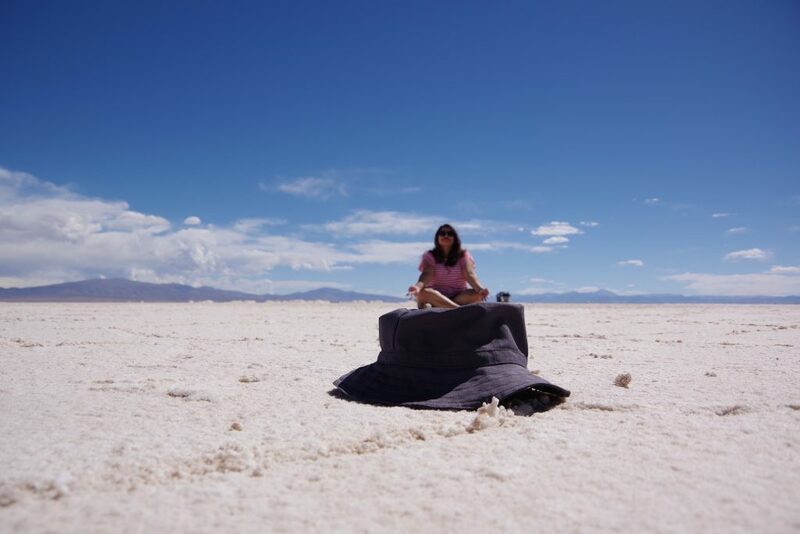 Our target was to drive from Salta to Salinas Grandes, salt flats close to Chile border. And from there, to Tilcara for the night. Salta to Salinas Grandes is 250 km and it is a further 92 km from there to Tilcara. Which left me a little concerned because if the road was anything resembling the Cafayate-Cachi road, we were in a REALLY LONG day on the road. Our checkout from the hotel was later than we would have liked, plus we had to find a gas station to top up our fuel tank. Thankfully, gas stations here are manned, so we don’t have to figure out the fuel pumps etc. for ourselves. There is usually a smiling attendant, to whom I have to say “Gasoline” “premium” and “completo” – and it is done. Gasoline prices here are 49 peso per litre, which comes to about INR 93 at current rates, making it much more expensive than India. The sadistic part of me takes small joy that we Indians aren’t paying the highest price for petrol in the world. 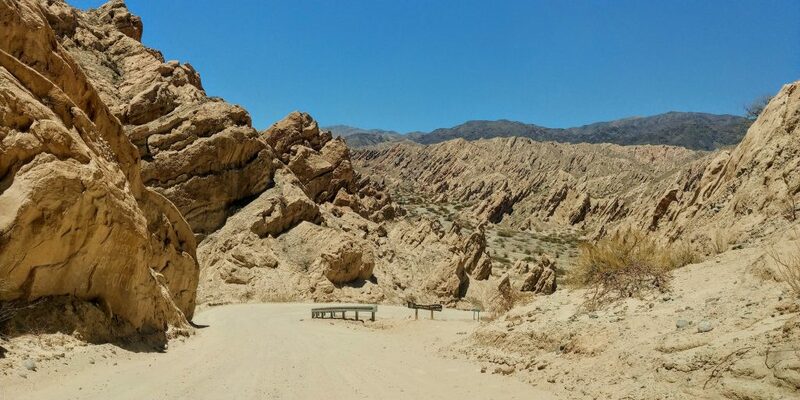 As soon as we hit the highway out of Salta, our fears about bad roads dispersed. 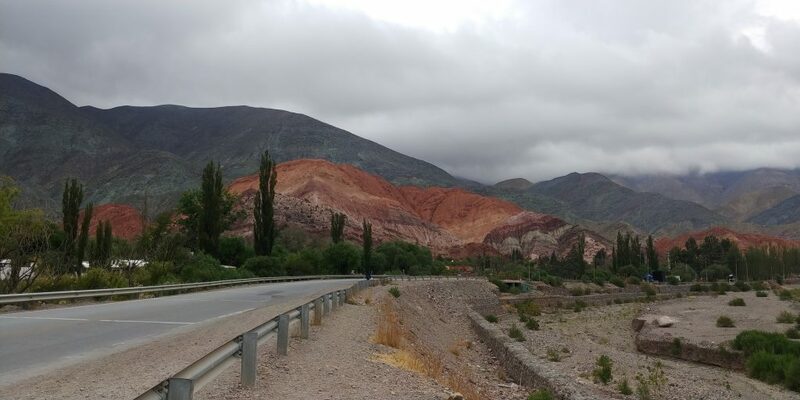 The roads were exceptionally good between Salta and Jujuy (pronounced ‘hoohooui’), the main cities in this region. Not super wide, like ones in Buenos Aires, but a generous three lanes on each side, with a really massive divider in the middle – like the best parts of the Pune-Mumbai Expressway. All the towns in the middle were bypassed with elaborate flyovers and were able to consistently keep speeds above 120-130 kmph for most parts. We reached Purmamarca, 180 km away, in less than 2 hours. Purmamarca is known for Cerro de los Siete Colores, (or Seven coloured hill) that overlooks the village. The hills are visible from the highway but we were not able to really spot the different colours in the mid-morning sun. The colours of the hills supposedly come alive during sunrise and sunset. We were able to drive by the hills a couple of more times during our trip and were able to see better colours. There is also a 45-60 min walk that goes around the hill which is best done during sunrise or sunset. We did not manage to find time for that. We stopped in the village for some lunch, as well as picking up couple of props for photography on the salt flats. There were a lot of handicraft stalls around the town square and we picked up a small llama figure and a bottle of Fanta. From Purmamarca, it took us about 1.5 hours to Salinas Grandes. The road continued to be exceptional, but now it was climbing up hills, through some really photogenic places. 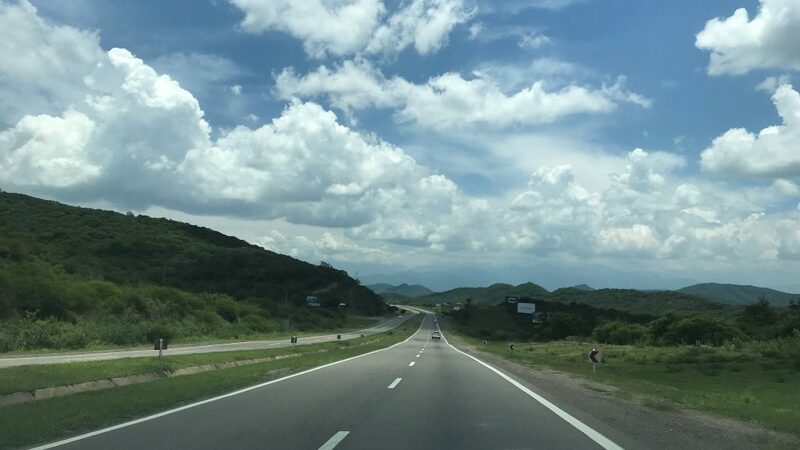 We later found out that the road is called Cuesta del Lipán (Lipan Slope) and it climbs from 2,200m (Purmamarca) to a maximum height of 4,200m at Abra de Potrerillos, before dropping down to Salinas Grandes at 3,450m. The entire road is paved, so it was a joy to drive on. The road surprisingly had quite a few trucks, transporting new cars on it. We figured it was a major highway between Argentina and Chile, as we were quite close to the border with Chile. 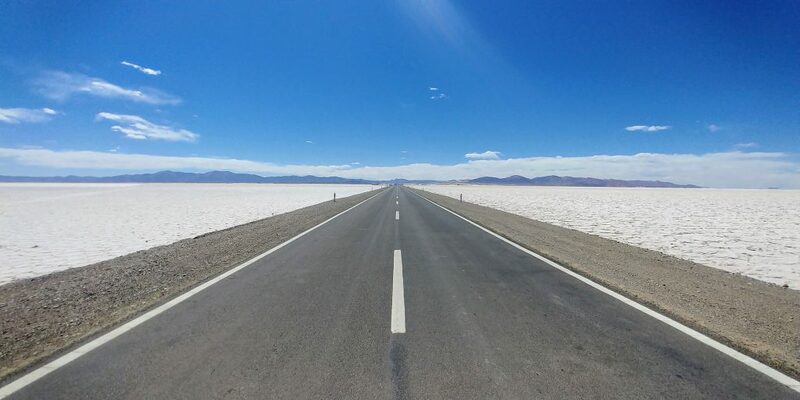 The final stretch of the road to Salinas Grandes is arrow straight and it is an absolute thrill to drive on it. The white salt flats can be seen in the distance and it keeps growing on the horizon as you speed towards it. We stopped multiple times on the road, trying to capture that view, but cameras failed miserably to capture the grandeur the human eyes were seeing. On one of our stops, we got lucky and spotted 3 vicuñas basking in the sun close to the road. We took a lot of photos from inside the car itself (did not want to startle or disturb the creatures) and then carefully moved on. Once we reached Salinas Grandes, we were greeted by an arrow-straight blacktop cutting through the salt flats. While the view was fabulous, we were a little disappointed that the salt flat itself was smaller than what we had expected. Since the salt flats is surrounded by mountains on all sides, it doesn’t give the feeling of infinity, like you get in the Rann of Kutch, for example. Nevertheless, it was still a very stunning landscape and we parked near the visitor centre and walked onto the salt flats (no entry fees). There wasn’t too much of a crowd when we arrived. There were two bus tours, but they left within 10 minutes of us reaching there and pretty soon we had the entire place to ourselves. But the strong sun at 15:30 and the high altitude made us feel weary and lethargic. We didn’t have a tripod, but we improvised and took some fun photographs using the phone app of our Pentax DSLR. Not all the photos turned out as good, but some of them were quite decent. The sun blazing down on us and the altitude tired us out more than we expected and we started on our way after spending an hour there. Tip: Even if it’s a hot day, wear full pants since you may have to kneel down or sit down on the salt flats to take perspective shots. The salt flat surface is very abrasive (much more than concrete). One of us had worn shorts and the knees hurt for a few hours after kneeling down for just a few seconds. As we were crossing the Cuesta del Lipán on our way back, some dark clouds were rolling in, threatening to swallow the road in fog. Not wanting to get caught in rain and or fog in such a landscape, we hurried as much as we could. And luck smiled on us and we were able to get back to the valley without encountering any rain. 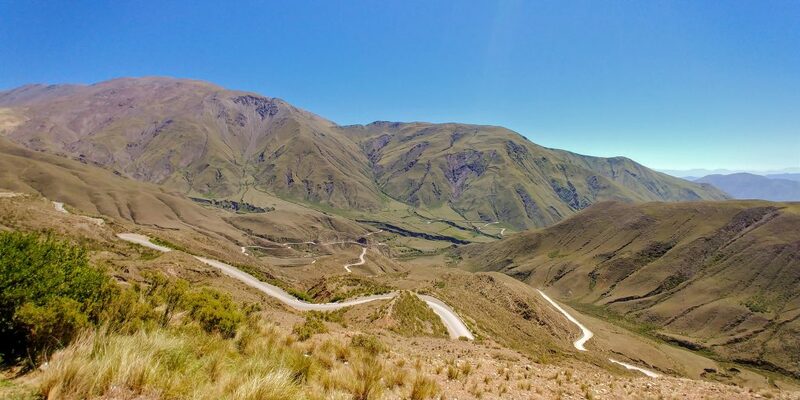 The road to Tilcara was smooth and fast and in half an hour we had covered the distance from Purmamarca to Tilcara. Our hotel in Tilcara, Posada con los Ángeles, turned out to be a delight. We got a large room with 3 beds, where we collapsed with exhaustion. We probably got a better room than we had booked since the hotel was mostly empty but we weren’t able to confirm that with our poor Spanish. The drive to El Hornocal was most interesting. It was very good metalled road, high speed and mostly straight, till the town of Humahuaca and we covered 45 km in just 30 minutes. We were not quite sure of the road to take from Humahuaca, as El Hornocal is not marked on Google Maps. We stopped by the tourist information center, located just where you turn from the highway into Humahuaca. They pointed us in the right direction, with a physical map which said El Hornocal is 25 km further from the town. Once we crossed the town and figured out which roads to take, we got down to business, maintaining 60 kmph over the gravel road. But once we started climbing the hills and hit the switchbacks, we were confounded by the lack of engine power. We did most of the climbing in second gear as third gear was almost useless. In a few places, we were having to shift down to first gear to keep the car moving. What we did not realize was that we had been climbing vertically pretty hard. Tilcara, our starting point, is at 2,500m above sea level. Humahuaca is at 3,250m and our destination, El Hornocal is at 4,350m. In the 1.5 hours it took us to cover the whole distance, we had climbed 1,850m (or 6,000 ft). Like everywhere else in Argentina, traffic was scant on the road, which is especially good on the gravel roads, because each vehicle kicks up a ton of dust and depending on the wind speed, the dust cloud could hang around on the road, dropping visibility to meters. Once we reached the top, Mirador El Hornocal (Mirador means lookout or viewpoint), the drive was totally worth it. El Hornocal was standing proud and bright, on a clear sunny day. The sky was a brilliant blue, with just a couple of white clouds floating. We could see 14 layers of colours on El Hornocal, although some of the shades were repeated. There were not too many people at the lookout, maybe 5 cars and 15 odd people, and it was a very peaceful place to be. Tip: There is a path that goes down from the viewpoint to catch a closer look at the mountains. While the trail going down looks easy enough, you need to climb back up which at those altitudes should be fairly difficult. Go down that path, only if you are very fit. After staying there for about half an hour, we retraced our route. Driving downhill was much easier than climbing up, and in 30 minutes we were back in Humahuaca. We parked in Humahuaca and strolled for a bit, looking for a place to eat. But perhaps we weren’t looking at the right part of town because we didn’t find a single eating place. With the heat now on the boil, we retreated back to Tilcara and quickly found a place for lunch. Post lunch, we visited the Pucara de Tilcara ruins, which is right inside the town. Like Quilmes, Pucara de Tilcara is also fortifications made on a hill. Although the climb wasn’t even half as high as Quilmes, under the 3pm sun, it was quite a chore. Or maybe our bodies were having a delayed reaction to the altitude of El Hornocal. 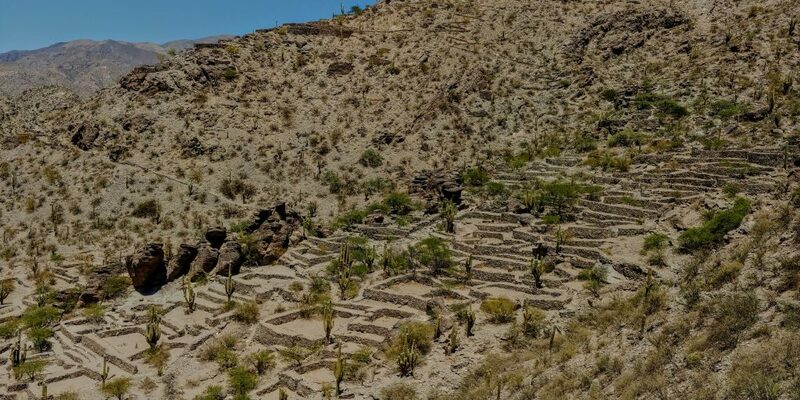 The ruins themselves are similar to Quilmes, as in they are on hills overgrown with cactuses. But the Quilmes ruins are in a much better shape and the restoration has a more natural look to it. The ruins at Pucara de Tilcara have a few restored walls and houses, but the restoration looks very modern and does not look in sync with the rest of the site. 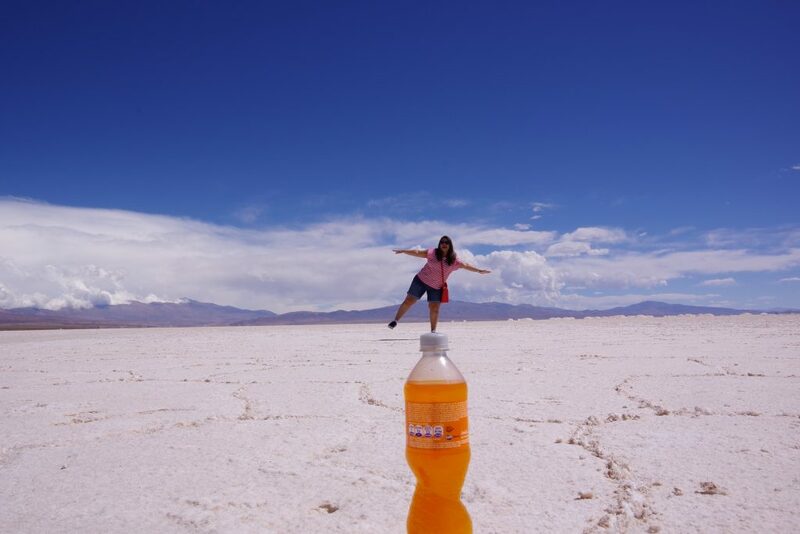 Overall, we much preferred Quilmes to the Tilcara ruins. The guards at the entrance charged us 100 pesos per head as ticket prices, gave us receipt for 80 pesos, while the board said charge was 300 pesos per adult. Still scratching our head over that one. 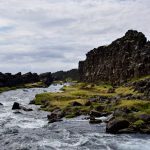 We had planned to visit the Garganta del Diablo* canyon and hike to a waterfall nearby. The trek was a few kms long and was supposed to be a practice for the tougher challenges waiting for us in Patagonia. With the summer getting into its stride, the highest temperature was inching to 27-28 degree Celsius. In order to save ourselves from toiling under the hot sun, we planned to start the day as early as possible but despite our best efforts it was 8:30 by the time we were loading our bags into the car. * there are two canyons named Garganta del Diablo in this region, one on the road from Salta to Cafayate and the other near Tilcara. When a sign on the road gave us the option of driving 8 km over gravel to the falls instead of hiking 4 km for the same, we just took the car. The gravel road was much more poorly maintained, a single lane in many places, but with the sun already beating down, it was a damn sight better than walking 4 km into a ravine. And as if to reinforce our decision, we found two flustered-looking hikers on the dirt road. We stopped and asked if we could drop them to the top. They happily jumped in. They turned out to be Argentinian management students from Buenos Aires, on a vacation. They had hiked for 1.5 hours to reach what seemed like the mid-point of the road. Apparently the 4km hike is all sloping upwards on an uneven trail and the heat made the going tougher. With our poor Spanish and their meagre English we managed to keep the conversation going. The drive from our hotel to the entrance of the canyon took 30 minutes. Tip: If you have a car, it’s probably best to drive to Garganta del Diablo from Tilcara and skip the hike. Unlike Patagonia, the views are apparently nothing to write home about and it can get uncomfortably hot in the summer. If you do want to hike, leave as early in the morning as possible to avoid the strong sun. We had to pay an entry fee of 30 pesos per head as well as mention our names/ID number and number of people – a good way to keep record if someone went missing I suppose. The way to the waterfall was a set of steep stairs into the ravine/valley and then a short walk in the valley. The trail in the valley crossed a narrow stream multiple times and we took our time on those, trying to keep shoes dry. 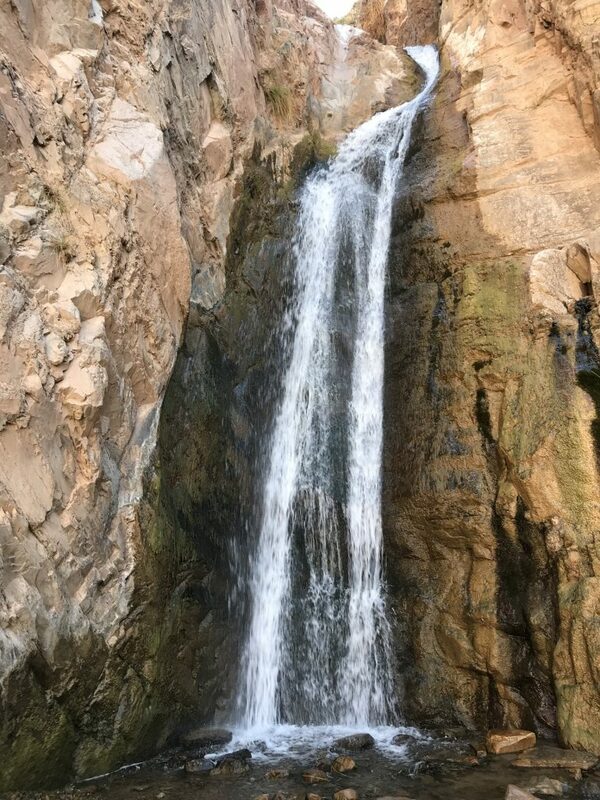 It took us 30 minutes to reach the waterfall. It was only a thin stream of water, but in a cool shaded valley it felt great. After drinking straight from the waterfall and taking a few photos, we started on our way back. The walk back was faster as we now knew all the crossing points. But the climb up the stairs back to the parking was arduous work. Just near the top, there is a slight detour that you can take to get a better look at the canyon – we had missed this while going down. We took the detour and got a better look at the canyon which gave this place the name Garganta del Diablo. 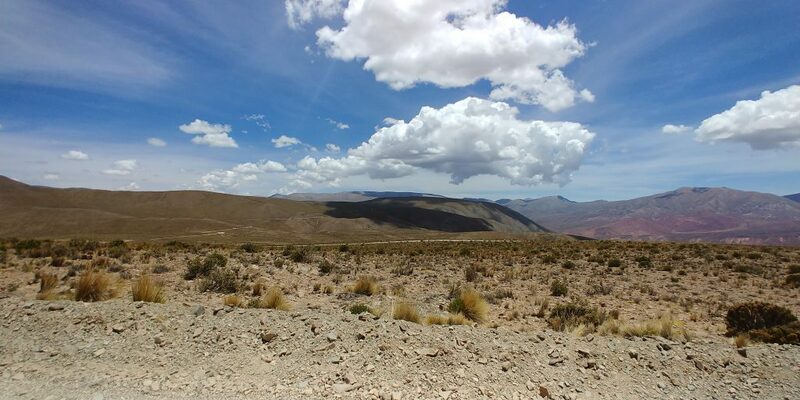 We tanked up on gas and started our journey back to Salta, which was uneventful. The next morning we took a flight out to El Calafate, the starting point of our epic Patagonian adventure! We spent 8 days in the region, which may not be possible for most. 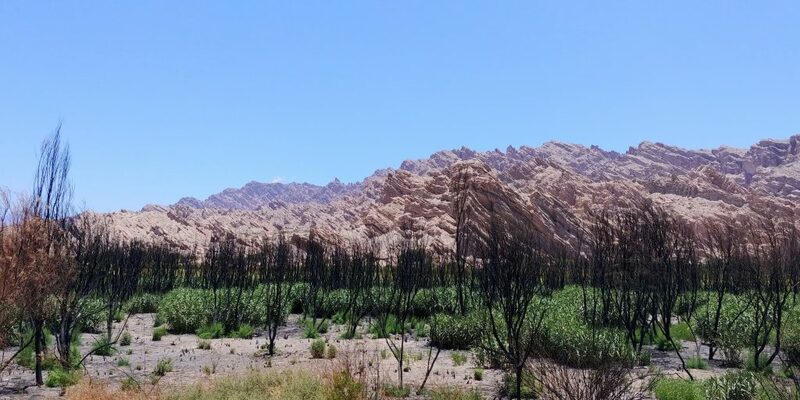 If you have only 3-4 days, we would suggest choosing either the Southern circuit (Salta-Cafayate-Cachi-Salta) or the Northern circuit (Salta-Purmamarca-Salinas Grande-Tilcara-El Hornocal-Salta). Between the two, we much preferred the Southern circuit. running at ~4,200m (~14,000 ft). We did not go for this as it seemed to involve a long bus journey with unnecessary stops to take the train. However, it may be worth considering it, especially if you are not driving in the region. Apart from Salta (and Jujuy), the other places are more like hamlets rather than towns. This is especially true for Cachi and Purmamarca, so form your expectations accordingly. Purmamarca and Tilcara are only 25kms apart and between the two, Tilcara has better stay and eating options. 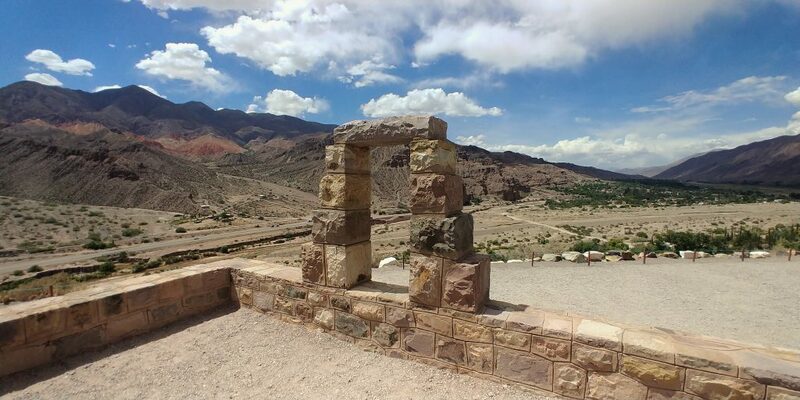 If you prefer more rustic surroundings, then go with Purmamarca. You do not really need a 4WD. A vehicle with higher clearance would help as some of the roads were gravel roads. We were fine with our Chevrolet Joy sedan. Also, we went before the rainy season had started – apparently during the rains there are small streams on road which make it trickier with a 2WD. 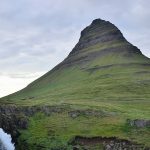 Acute Mountain Sickness (AMS) can be a serious concern for some people as you will be visiting many high altitude places. It is best to read up more about it and consult your doctor to check if you need medicines to manage it. There is no mobile signal on most of the roads and even within the cities, the data speeds were pretty dismal on Claro. So, it is absolutely necessary to download the maps of the region on Maps.me and/or Google Maps before you leave for Salta. Outside the cities, we found Maps.me to be more useful than Google Maps as it has better information about tourist attractions, including walking trails. For most of our travel in South America, we used Maps.me more than Google Maps. Fill up your petrol tank whenever you get a chance and make note of where the next petrol station is before you start the day’s driving. 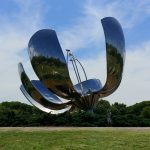 A note about dryers in Airbnbs in Argentina (South America): Many Airbnbs list washer and dryer in their amenities. But the dryer mentioned is usually just the spin dryer that is included in the washing machine and not the heavy-duty dryer that is more common in Western countries. So you would still have to line dry your clothes.